Jazz Guitar Elements is a modern jazz guitar method which focusses on chords, scale, arpeggios and improvisation. 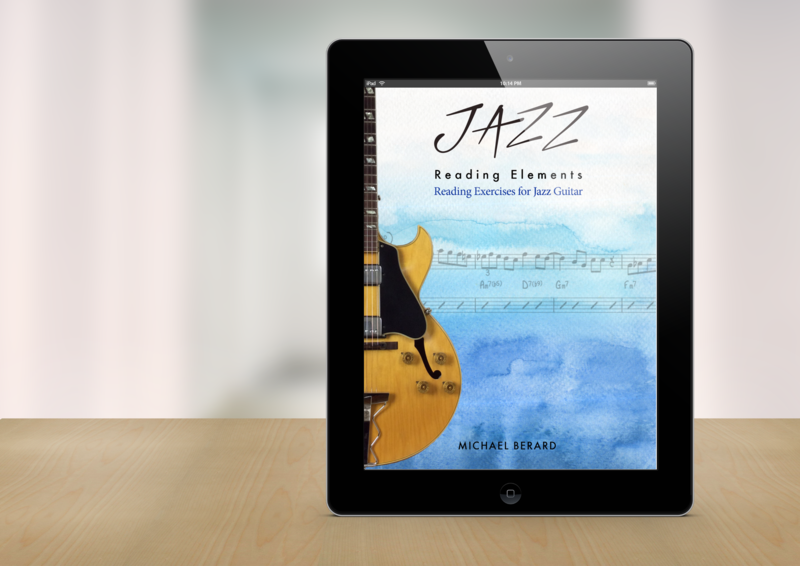 The eBook is a no gimmicks approach to learning the essential information you need to advance as a jazz guitarist. The book contains a wealth of information along with clear illustrations, exercises and audio examples. Jazz Guitar Elements as a part of your regular practice routine will help bring lasting results. A new sight reading book featuring 34 all original exercises. The exercises progress from an easier level of difficulty to more challenging ones. Also includes a second staff with chord changes. The chord staff includes rhythm and slash marks as well. Styles range from jazz standard type tunes to bossa nova, straight 8th, waltzes and modern jazz. Not a "How To" book on reading but rather a collection of interesting and musical exercises to read. * iBook is for iPad, iPhone and Mac only. * Amazon Kindle Edition works on Kindle Fire Tablets, Fire Tablets and on the free Kindle Reading app available for iOS, Android, Mac and PC. Looking to upgrade to the latest version of Jazz Guitar Elements with Audio? Email: sales@michaelberard.ca to request a coupon code to recieve 40% off. Applies to Jazz Guitar Elements PDF + Audio. "This is a great book for any guitar player wanting to expand his or her Jazz vocabulary. Being chords, scales, or arpeggios… the book is very clearly written, with great music examples and exercises." 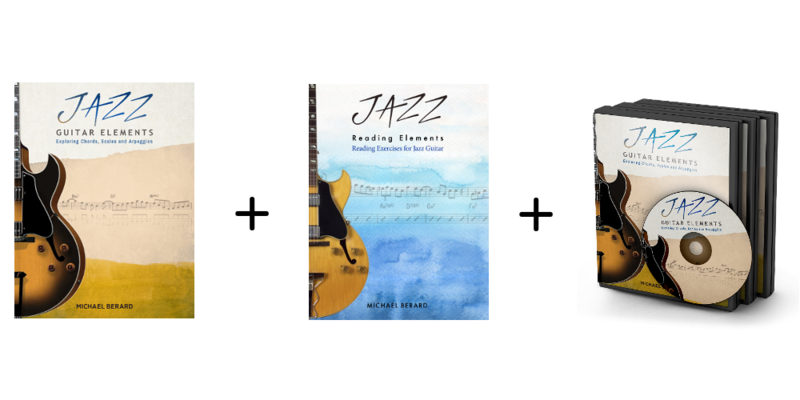 More about "Jazz Guitar Elements"
This book is intended to help the student jazz guitarist acquire the tools and skills necessary to become an accomplished jazz musician. 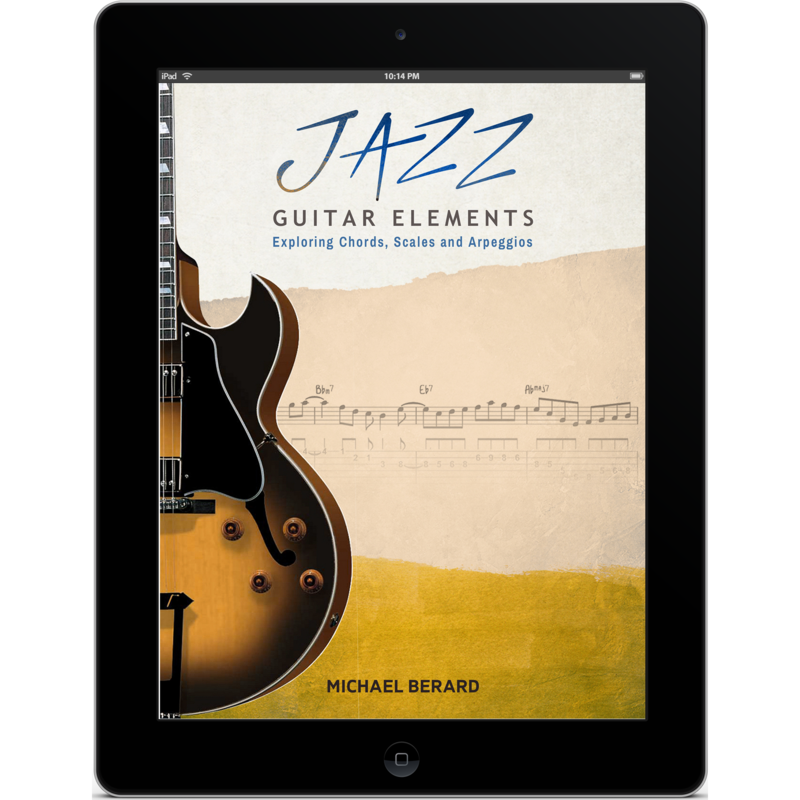 "Jazz Guitar Elements" focuses on the essential information about chords, scales, arpeggios and improvisation that you need to know. It is not only about learning the guitar fingerboard, but understanding it in a way which is meaningful for jazz guitarists. The goal of this book is to foster a deeper understanding of the harmonic rules associated with jazz comping and improvisation in conjunction with a thorough understanding of the guitar fingerboard. 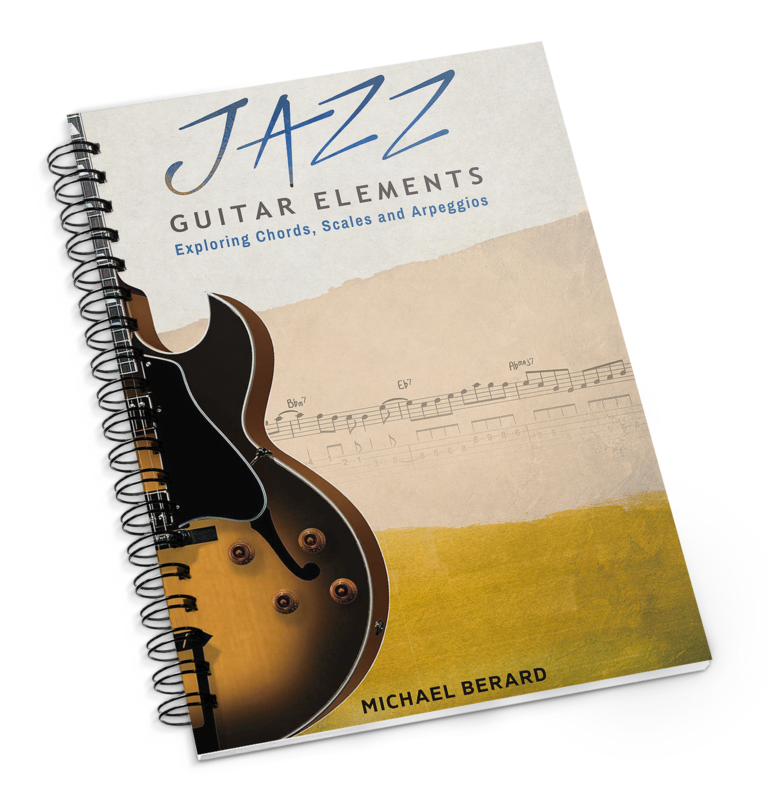 Jazz Guitar Elements is an excellent resource for any guitarist who already has a basic knowlege of the guitar. It is intended for the intermediate level jazz guitarist who wants to take it to the next level. Used along with a Fake Book, a healthy collection of jazz recordings and some good old fashioned hard work, this book can take you a long way. What's inside "Jazz Guitar Elements"
The iBook version contains 161 pages and the PDF and Kindle versions each contain 218 pages. All 3 versions are filled with concise explanations, diagrams and examples. Topics are presented with clear reference to their use in jazz comping and improvisation. Chapter 4 includes modal jazz and Bebop compositions, each with melody and solo. All are original compositions written exclusively for this book and include music notation, tabs and audio. Audio examples are embedded right into the iBook and Kindle versions. Simply tap the play button to hear the audio example. For the PDF version of "Jazz Guitar Elements," audio examples are available in mp3 format. Icons are provided in the PDF book indicating the corresponding track number for each example. Answers for the PDF and Kindle versions can be found at the end of the book. For the iBook, simply tap an icon to reveal the answer or more information about the item. Here's a quick look at chapter one of the iBooks version. In this video we can see how we navigate through "Jazz Guitar Elements." We also see the book's layout, pop-up windows, audio players and overall interactivity. Moving around in Jazz Guitar Elements is very easy thanks to the thumbnails. The bullets at the bottom allow you to switch chapters quickly and easily. Want to take a closer look first. Check out the free samples! If you'd like to get a feel for the book before you buy, download one of the free samples. The samples each contain pages from all chapters. Read through some of the lessons, try some of the exercises and listen to the recorded examples. There is enough material in each sample book to get you started. The iBook samples are for iPad, iPhone and Mac only. The links will take you to iBooks. The PDF + Audio sample is a zip file and will download automatically. You will get the sample book and 7 audio examples in mp3 format. If you are on an Android tablet, you will need to use a 3rd party App to open the zip file. *For the Kindle Edition of Jazz Guitar Elements, visit Amazon to "Look inside"
*For the Kindle Edition of Jazz Reading Elements, visit Amazon to "Look inside"
Michael Berard was a part-time music professor for over 25 years at Concordia University in Montreal Canada. There he taught jazz guitar, jazz arranging, jazz composition as well as other jazz related courses. 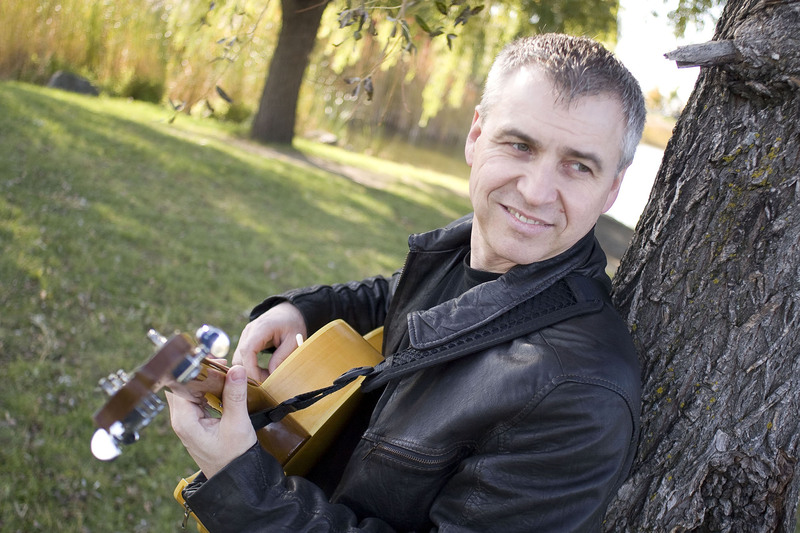 He has worked as a jazz musician in Montreal playing jazz clubs, concerts and studio sessions. Michael has played on numerous recordings including 3 of his own: "It's Autumn," "Little Voices" and "Good News." To receive information on future updates, special offers and more, subscribe to our mailing list.